I don’t know what to even say about this, as I’m completely lost for words. Drinking an iPhone X, really? Wow, people have really stooped to a whole new level of low to get views on YouTube. Many people today become viral for the silliest of things, whether it’s brushing your teeth with a gun, or eating 68 pounds of McDonalds in five minutes, it’s safe to say that today’s social media obsessed generation, have completely lost it. However, in YouTuber, TechRax’s, latest video, he has taken this awful madness to the next level. 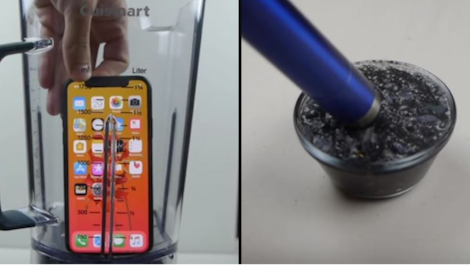 There are tons of videos out there of people setting iPhones on fire, or blending them up, sometimes cutting them in half with a really hot knife, all in the nature of curiosity, to see what is really inside these tech inventions. Although, none of these somewhat sane people have ever digested their experiments, until today. TechRax combined two experiments in one, blending an iPhone X, and testing out the LifeStraw. If you don’t know what the LifeStraw is, it’s a wonderful invention that can be used in third world countries, to filter dirty water, so that it is safe to drink. In the case of TechRax, he tested to see whether the LifeStraw would filter out all the rubbish in an iPhone X, so that he would end up drinking just water. I don’t know where the logic in this is, and whether there is any water in an iPhone X, but the experiment went ahead anyway. As the video went on, TechRax discovered that the LifeStraw, in fact, did not filter out the debris from the iPhone X, and he got a mouthful of metal. Probably a good thing, as now he has something to get rid of the taste of regret. Don’t try this at home, kids. Do you think this experiment was stupid, or pretty clever? Do you reckon people have officially lost their minds in order to gain fame? Let us know in the comments, or on Twitter at @WhatsTrending.